Alright, I kinda hate the word swag, but I'm using it because that's what we have. Ron's parents got us some sweet Columbia windbreaker/rain jackets and had them personalized. Technically, they were birthday presents for us both even though my birthday was back in January. Turns out I like getting presents for Ron's birthday too. 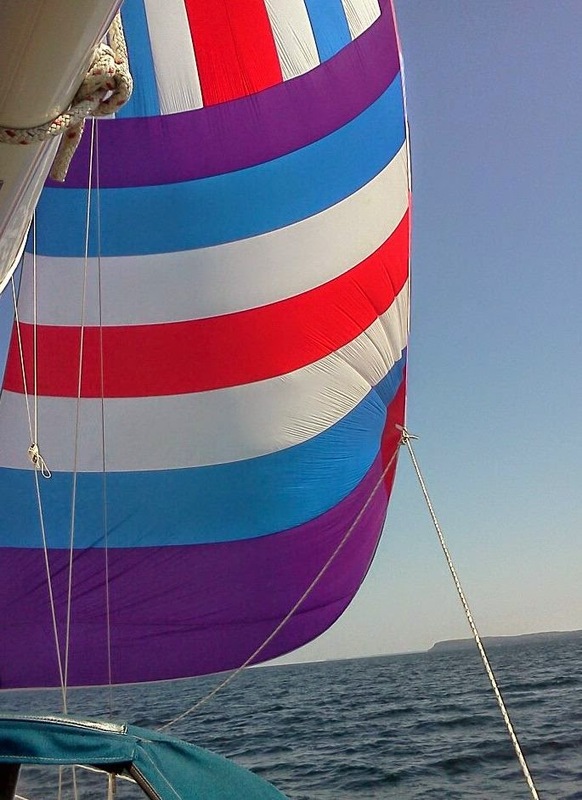 Does that spinnaker look familiar? Ron's mom was able to 'procure' a picture of the spinny from Facebook so the jackets aren't just personalized, they're graphically accurate...how awesome is that?!? Gee, if people see us wearing these around they might make the mistake of thinking that we know what we're doing! Great in the states, but if you are in a small harbor anchored out in a poor third world country, don't wear them to town. Lets all the wrong people know you are off the boat. Perfect time for "them" to visit. Happened to two different friends. Good point, we'll keep that in mind.